These guidelines will help you have a successful, rewarding experience learning an instrument. Adults can start any instrument at any time. Their success is based on how willing an adult is to commit to practicing. We have had beginner students in their 60’s and 70’s.For children, starting at the right age is a key element to the success of their lessons. Some people will tell you “the sooner the better” but this attitude can actually backfire and be a negative. If a child is put into lessons too soon they may feel overwhelmed and frustrated and want to stop lessons. The last thing you want to do is turn a child off music just because they had one unpleasant experience which could have been prevented. Sometimes if the child waits a year to start lessons their progress can be much faster. Children who are older than the suggested earliest starting age usually do very well. The following are guidelines we have found to be successful in determining how young a child can start taking music lessons. If you have any doubt, though, taking one lesson can be extremely helpful to see if a child is ready. 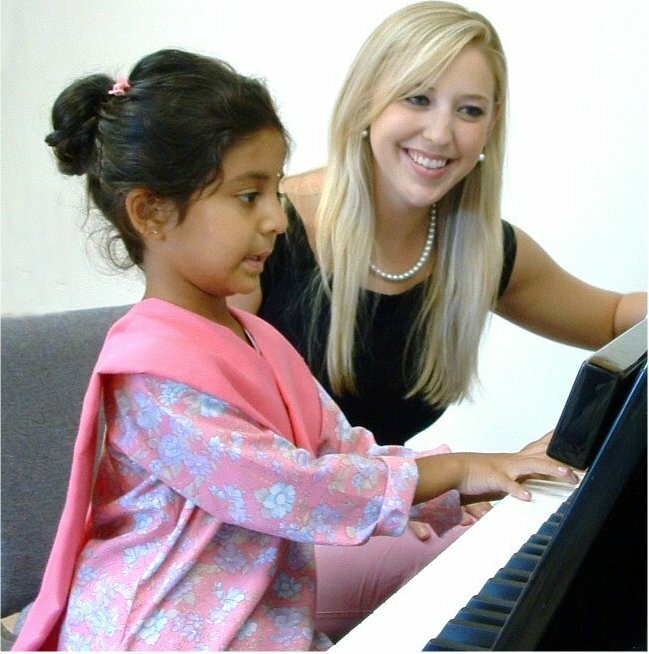 At our school 3 1/2 or 4 years old is the youngest age that we start children in private piano lessons. At this age they have begun to develop longer attention spans and can retain material with ease. Age 4 or 5 years old is the youngest age that we start children in guitar lessons with child-size guitars. At this age, the parent's supervision is vital to progress. Bass guitar students generally start at 10 years old and older but can begin fundamentals on the guitar as early as 4. 5-6 years old is the youngest age recommended for private vocal lessons. Several important aspects of singing can be taught at this age even though full vocal technique would not necessarily begin until age 10. Due to the physical nature of voice lessons (proper breathing techniques, development of the vocal chords and lung capacity), the younger body is generally not yet ready for the rigors of complete vocal technique. Yet, very important elements of singing such as melody, pitch and rhythm can be taught at 5 or 6. Drum/percussion lessons can start as young as age 5. This varies depending on the size and attention span of the child. Due to lung capacity (and in the case of the saxophone the size of the instrument), we recommend that most woodwind beginners start at 8 or older with the exception of flute which can be started at as early as 6. We accept violin students from the age of 3 or 4 but do recommend an introductory lesson to see if they are ready yet. The trumpet requires physical exertion and lung power. 9 years and older is a good time to start the trumpet. 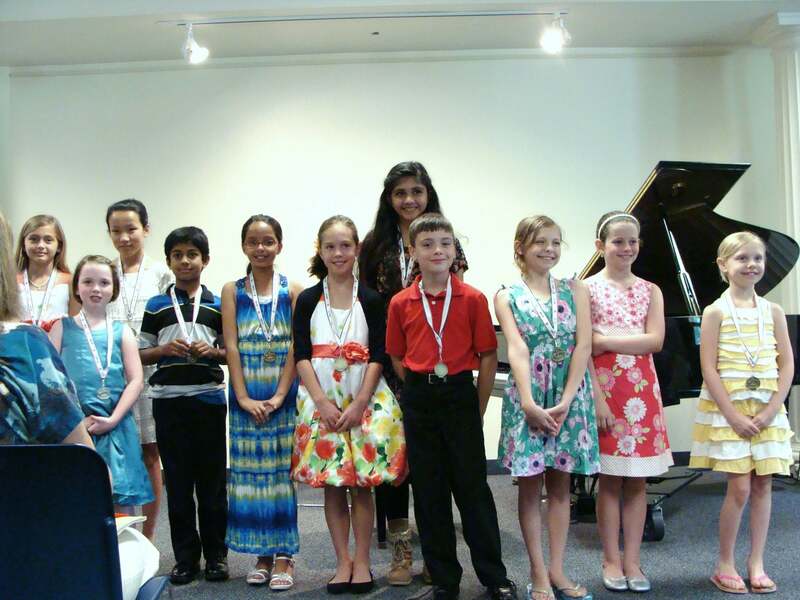 With the proper foundation in learning an instrument or voice, a student can progress much faster and have more fun. Studying with a teacher with qualified university training in their instrument is very important in establishing this foundation which can last him/her a lifetime. A bad habit that goes undetected can easily be detrimental and impede the progress and joy of playing. These habits often take a long time, even years, to correct. However, the right foundational techniques can be learned in the first 2-3 years of lessons, a critical time in a student's education, saving time and money. Learning music is not just a matter of having a qualified teacher, but also having an environment that is focused on music education. "In-home" lessons have the advantage of convenience as long as the teacher continues to come to your home. In a professional school environment, though, a student cannot be distracted by the usual comforts of home such as toys, t.v., pets, siblings, what's going on outside the window, books, food cooking in the kitchen, play station, ringing phones, or anything else. With these distractions removed from his/her attention, a student is able to concentrate on one thing only: learning and enjoying music with his/her teacher and therefore getting the most out of music lessons. With only 1/2 to one hour of lesson time per week, we find that a professional school environment produces better results since the only focus at that time is learning music. Students in a school environment are also motivated by hearing peers who are at different levels and by being exposed to a variety of musical instruments. In a music school, the lessons are not just a hobby or sideline for the teacher but a responsibility which is taken very seriously. As with anything, improving in music takes practice. One of the main problems with music lessons is the drudgery of practicing and the conflict between parents and students to practice every day. We use this method quite often when setting practice schedules for beginners. For a young child 20 or 30 minutes seems like an eternity. Instead of setting a time frame, we use repetition. For example, practice this piece or "spot" 4 times every day, and this scale 5 times a day. The child then does not pay attention to the amount of time they are practicing their instrument, but knows if they are on repetition number 3 they are almost finished. Repetition of correct playing is the key to success. This works very well for both children and adult students. Some adults reward themselves with a cappuccino after a successful week of practicing. Parents can encourage children to practice by granting them occasional rewards for successful practicing. In our school we reward young children for a successful week of practicing with stars and stickers on their work. Praise tends to be the most coveted award - there just is no substitute for a pat on the back for a job well done. Sometimes we all have a week with little practicing, in that case there is always next week. There are some excellent materials developed by professional music educators that are made for students in a variety of situations. For example in piano, there are books for very young beginners, and books for adult students that have never played before. There are books that can start you at a level you are comfortable with. These materials have been researched and are continually upgraded and improved to make learning easier. These materials ensure that no important part of learning the instrument can inadvertently be left out. If you ever have to move to a different part of the country, qualified teachers and institutions will recognize the materials and be able to smoothly continue from where the previous teacher left off. HAVE FUN! !